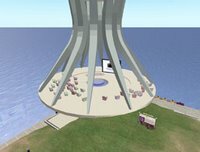 of Applied Sciences open up in Second Life. 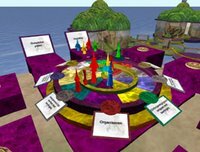 Fontys has been building the sim in the past three months, setting up a virtual campus in 9 bits and pieces, each faculty build their site, which makes up for the somewhat unorganised appearance. In short they plan to explore and experiment the technical and education options in Second Life. There's Fontys Campus Radio all over the place and several students from the Fontys Rock Academy can be seen on the many video screens. Then there's mixed reality experimenting by the Faculty of Education, who have put up twitter and the internetbunny 'Nabaztag' This RL bunny is equiped with an AI and hooked up by WiFi and transmits messages from Second Life into the realworld.